FILE - President Donald Trump points to members of the media as he speaks during a meeting in the Cabinet Room of the White House in Washington, Aug. 1, 2018. While the media and the American presidency have long had a symbiotic but frequently antagonistic relationship, since Donald Trump took office it has largely turned toxic. Trump has repeatedly termed the media the "enemy of the people." He has called the press "dangerous and sick" and even alleges journalists can "cause war." Some American media outlets are declaring they have had enough of the president's rhetoric, which they decry as dangerous. Newspapers across the country pushed back Thursday with an unprecedented and coordinated editorial campaign, led by The Boston Globe, which declared "the dirty war on the free press must end." The Globe said nearly 350 news organizations have pledged to participate. The New York Times' editorial page editor, James Bennet, told his newspaper that "our publisher has put a stake in the ground on this issue, and at a time when newspapers around the country are under real commercial and political pressure, we think it's important to show solidarity." ​According to Trump, who made public an off-the-record meeting last month with Times publisher A.G. Sulzberger, the two discussed "the vast amounts of fake news being put out by the media." Sulzberger subsequently issued a statement, saying he found the president's language "not just divisive but increasingly dangerous." "News reporters and editors are human, and make mistakes. Correcting them is core to our job," the Times' editorial Thursday says. "But insisting that truths you don't like are 'fake news' is dangerous to the lifeblood of democracy. And calling journalists the 'enemy of the people' is dangerous, period." Every participating newspaper in Thursday's campaign — which includes large and small newspapers across the political spectrum — will write its own editorial, not necessarily using the same rhetoric as the politically left-of-center Globe. "What I like about the coordinated effort is not so much that we're going to have a message that aligns with them, because they may have a much more aggressive message," said David Plazas, the opinion and engagement editor of The Tennessean in Nashville. "Our message is one that's consistent with our values, which is to defend the First Amendment, to stand for civility and to give voice to the voiceless people." At The Tennessean, one of the largest newspapers in a state that voted 2-to-1 for Trump in 2016, Plazas emphasized that Thursday's editorial would not target the president. "I may not even mention President Trump in my particular editorial," he told VOA. "This is beyond one person. This is about defending our values and institutions." The Dallas Morning News wrote in its editorial that while previous U.S. presidents have had grievances with the media, Trump has publicly challenged the legitimacy of the country's major news organizations at an unprecedented level. "The crucial difference is that rather than taking issue with one story or even a series of stories, the intention seems to be to undermine the credibility of the press as a whole with a large swath of the citizenry," it wrote. "We see this as dangerous for the simple reason that by diminishing the press, those who hold high office gain a greater ability to govern without the steadying force of public scrutiny." Not only newspapers are participating in the campaign. The Radio Television Digital News Association is asking its 1,200 members to dedicate airtime, post online editorials and share information on their social media platforms about the role they play in preserving the public's right and need to know about government. "I have covered White Houses myself. I've watched this for a very long time. I have never seen — and I cannot imagine — a situation where there is more tension, hostility between the press corps and the president, mostly coming from the president," said professor Frank Sesno, a former CNN White House correspondent who is now director of the School of Media and Public Affairs at the George Washington University in Washington, D.C. FILE - Reporters raise their hands as then-White House press secretary Sean Spicer takes questions during the daily briefing in the Brady Press Briefing Room of the White House in Washington, Feb. 22, 2017. Some conservative media critics, however, contend the media are overreacting. The Globe's campaign "shows how thin-skinned the media is in this case," according to Don Irvine, chairman of Accuracy in Media, a nonprofit media watchdog organization. "While Trump's attacks on the media have been more pronounced than any president since [Richard] Nixon, he is well within his rights to express his opinion," Irvine told VOA. "The press seems to be under the impression that there is some unwritten rule that the president can't attack the media, even if they are wrong. Trump knows that public trust in the media is at an all-time low, and he is taking advantage of it." The president "took advantage of a pre-existing negative attitude towards the media," concurred Gallup Poll editor in chief Frank Newport. However, "I have to reinforce that we've seen very negative attitudes towards the news media for a number of years, long before Donald Trump thought about running for president," he told VOA. "There is no doubt about it: A lot of Americans, when we interview them and other pollsters interview them, say the media are biased." A Quinnipiac poll, conducted by telephone August 9-13, found 51 percent of Republican voters expressing an opinion that the media are the enemy of the people rather than an important part of democracy. Just 26 percent of voters overall felt that way, according to the poll. The survey also revealed that 44 percent of American voters were concerned that Trump's criticism of the news media would lead to violence against people who work in media. Breaking it down by party affiliation, 76 percent of Democrats felt that way, while 80 percent of Republicans did not. Fifty-five percent of those with no party affiliation expressed such concern. Such attacks could occur at one of Trump's frequent rallies where the crowd is stoked by the president's anti-media rhetoric, according to Robert Weissman, president of Public Citizen, a nonpartisan, nonprofit consumer advocacy organization. "So far, there's been intimidation but no violence. But that line can easily be crossed, and anyone who's seen the videos of some of these rallies knows we're very close up against that line," Weissman told VOA. The Trump administration contends many American mainstream media outlets treat it unfairly. While journalists note that being the target of presidential criticism is often part of the job, for some, being labeled enemies of the people — a phrase equated with the brutality of Stalinism — goes far beyond the pale. 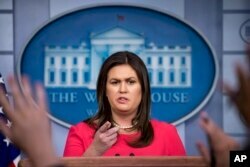 The frustration was palpable at a briefing on August 2 when CNN's Jim Acosta pressed White House press secretary Sarah Huckabee Sanders to declare on the spot that the media are "not the enemy of people. I think we deserve that." FILE - White House press secretary Sarah Huckabee Sanders calls on a member of the media during the daily press briefing at the White House, July 18, 2018, in Washington. Sanders demurred, instead noting that she is the first in her position to require Secret Service protection, partly blaming reporters for that. "The media has attacked me personally on a number of occasions, including your own network, said I should be harassed as a life sentence, that I should be choked," Sanders replied to the CNN White House correspondent. For some critics, the blame for the lack of civility falls squarely on the president's shoulders. "If you're a true conservative, you're supposed to respect American institutions like the free press, the judiciary and law enforcement that have stood us so well over the centuries. And he's just tried to tear them down," Allan Lichtman, a professor of history at American University in Washington, told VOA. "And that really is, hopefully, not a new normal, but certainly something we haven't seen for some time in America." Elizabeth Cherneff, Jim Malone and Patsy Widakuswara contributed to this report.